“Guardians of the Galaxy Vol. 2” has an intriguing plot as well as strong character development. This anticipated sequel was another box office success for Marvel. 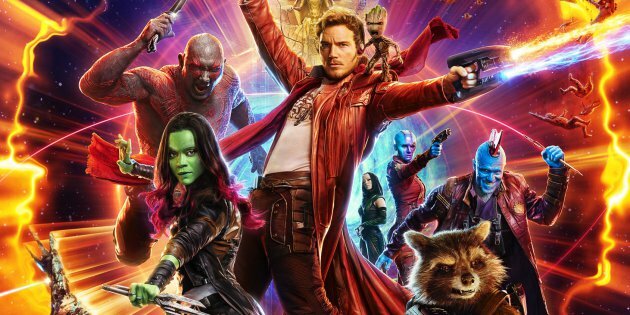 Picking up where the first Guardians movie left off, our beloved antiheroes of Peter Quill, Gamora, Drax, Rocket, and an adorable, shrunken Baby Groot are doing what they do best; helping defend the galaxy one planet, one problem, and one weird alien monster at a time. As expected, no good deed goes without Rocket stealing something and over-the-top violence used in retaliation. In this case, an entire remote controlled fleet attacking seems justified for a handful of switched batteries. Just when all hope seems lost, unexpected help comes and rescues the Guardians moments before their ship is destroyed, although they do crash into a nearby planet. This seemingly plays into Peter Quill’s absent and alien father. If one remembers the end of the first “Guardians of the Galaxy,” Yandu states that he had the opportunity to turn over a young Peter to his father but decided against it. At first glance, Ego, Peter’s father, is a wonderful character. He is positive, helpful, and kind. Ego is a Celestial, a god-like, immortal alien who can build planets, control and shape objects, and destroy worlds. He planted bits of himself on to overtake and shape the galaxy in his own image. He needs Peter’s help to either shape the Galaxy as he pleases or burns him up for the necessary power if he refuses. Other plot lines the movie follows are Gamora’s vengeful sister Nebula and Yandu as a champion for good. Like most superhero themed movies, the overt theme of “Guardians 2” is family. Friends can be just as close as family, especially if the family you have isn’t exactly the kindest, greatest, or even alive. Also, many times mentors or parental figures can come unexpectedly. What I found the most surprising were Yondu’s character change. A character who was a lowly, selfish bounty hunter to a man who saved a little boy and treated him with genuine care. As the rating of PG-13 may suggest, there is a fair amount of cursing. But, no more than what was in the original “Guardians of the Galaxy.” While I missed it by just one viewing, there is an awesome looking 3D version of this movie playing for a limited time in theaters. While this may sound great, be warned that there is violence galore in this flick in addition to plenty of frightening scenes and harrowing moments. Overall, this movie is pretty typical for a Marvel movie: violence, cursing, and plenty of action.Other than that, the plot is surprisingly unique, intriguing, and deep when compared to the numerous reboots seen yearly. If you enjoy space operas, have a weak spot for science fiction, Marvel, or simply liked the first movie, then “Guardians of the Galaxy Vol. 2” is definitely something you should go see. Morgan Saddleson is a staff writer for The Daily Runner.